Gallup is the true gateway city, perfectly situated for easy access to regional attractions. We are only a 90 minute drive from some of the most spectacular scenery and one of a kind attractions - ideally situated for your Southwestern adventure-- Day trips abound, you might have to stay longer just to see everything--A short list includes Four Corners Monument, El Morro National Monument, Monument Valley, Petrified Forest, Shiprock, Canyon de Chelly National Park, Chaco Culture Nat'l Park, Homolovi Ruins, Hopi Reservation, Navajo Capital and so much more. Gallup has plenty to offer - many restaurants, art galleries, southwestern and Native American arts and crafts, Trading Companies, hot air ballooning, golf, not to mention mild weather and friendly residents. 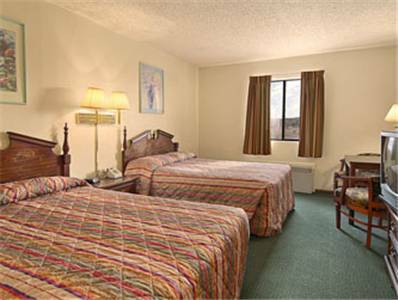 After a long drive or a day of sightseeing you will appreciate our Super 8-- Unwind in our indoor heated pool or take a stroll to the many restaurants nearby. Our friendly staff is available 24 hours to answer any questions and make sure your stay is a memorable one. You will not lose any sleep about your choice in overnight accommodations either- Sleep well on brand new pillow top mattresses, our beds are extremely comfortable and our prices are even more affordable. Our rooms are large, have tables and chairs for work or leisure, 25 inch remote control TVs with cable including HBO,ESPN, ESPN2, AMC and more. We also offer complimentary continental breakfast, free wireless high speed internet, in room coffee makers, and hairdryers in all rooms, and free local calls. Please Note: Our pool will be closed until April 1, 2013 for scheduled maintenance. Thank you for your understanding and we apologize for any inconvenience. Memorial at Navajo Nation Headquarters remembers WW II's Legendary Navajo Marines, whose language was used as a unique and cryptic tactical communications code in battle. A distinctive giant tee pee lures I-40 drivers into pulling off for a look -- and maybe a browse at the Tee Pee Trading Post. A remote, vast work of "land art" by Walter De Maria, built in 1977. Visitors must spend the night in a cabin that sleeps six, surrounded by a field of 400 lighting rods. Despite this arrangement, Lightning Field is more a New-Agey art experience than a rite of weather terror.